'Tis the season of re-gifting, and so I make bold to pass along this list of 16 of the most popular posts of 2014 at this website, at least one from each month, in reverse chronological order. Of course, I encourage you to spend your holidays surfing the Conversable Economist archives; after all, unless your personal interests are perfectly aligned with pageview popularity (and isn't that a frightening thought? ), you are likely to find other posts of interest, too. The economy of a country and its potentinal for future growth is based on the skill levels of all workers, not just on those who attend the best colleges and universities. The U.S. has been underperforming in education for decades, and the international statistics show it. Here are a few of the many figures that caught my eye from Education at a Glance 2014: OECD Indicators. This figures compares the percentage of those with a tertiary education comparing 25-34 year-olds to the education level of 55-64 year-olds. The black squares show the older group; the blue triangles show the younger group; and the light blue bars show which countries have been expanding education in a way that the younger generation is well ahead of its elders. One wouldn't expect the U.S. to have the highest level of gains, given that other countries had much lower levels of those with a higher education several decades ago--and thus greater potential for gains. Still, it's a little shocking to see that the U.S. shows almost no intergenerational gain in education levels, and is second from the bottom in such gains. 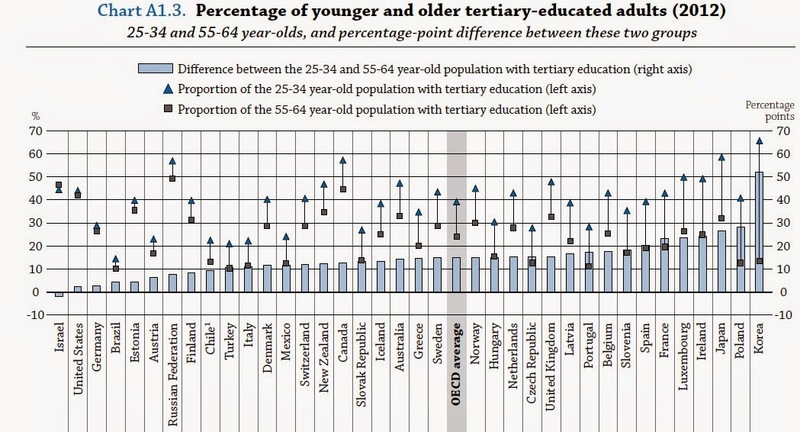 Tou can also see by the position of the blue triangles that the U.S. is just barely above the OECD average for tertiary education in its 25-34 age group. A quick retort to these kinds of figures is to point out that perhaps higher education in some other countries is of lower quality, and so it doesn't mean as much to have a tertiary degree. Well, maybe that's part of the dynamic here. But those who are starting to lag behind always complain about the unfairness of what is being measured, don't they? How about at the high school level? Here are upper secondary graduation rates across countries. The U.S. ranks below the OECD average. 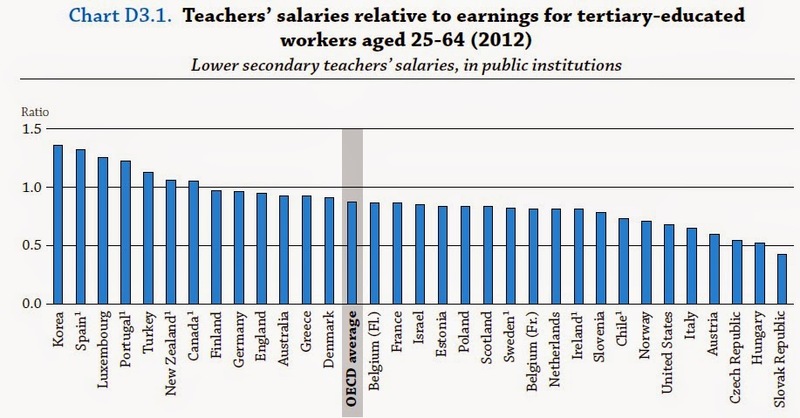 The teaching hours contractually expected from U.S. teachers are relatively high. On the other side, average class sizes are slightly smaller in the U.S. than the OECD average. Here's an example for primary education classes. What about enrollment rates in preschool? Again, the US is below the average. As I've expressed before on this blog, my reading of the evidence on the proven gains from early childhood education is not especially encouraging (for exmaple, here and here). But even if the effects of U.S.-style preschool on children can be questions, there's no question that it can serve as a subsidy to help low-income families with the costs of their child care, and to make it easier for mothers in low-income families to keep a better connection with the workforce. One of the things that "everyone knows" is that the successful economies of the 21st century will be built on high-skilled workers. The U.S. used to lead the world in educating its population, but no longer. Just spending marginally more money on the existing system isn't likely to be a successful answer. Some deeper rethinking is needed. Sunk Cost Fallacy: Do Children and Animals Avoid It? The sunk cost fallacy appears in every introductory economics course. Rational behavior suggests that people should realize that they can't change the past. The amount of money or time or energy that has already been spent on some project is a "sunk costs," and it should be irrelevant to whether you keep going with the project. When making a choice, you should look only to the future costs and benefits of your actions. Many people find it hard to disregard sunk costs. There are the romantic relationships that have been lukewarm or worse for a long time, with no likely prospect of change, but where one or both people can't break up because they've been together for so long. There are the investors whose stock portfolio or house has lost value, but who doesn't sell because if they just keep holding on, they can pretend that those losses haven't yet happened. There are large projects in business and government where a lot has been spent in the past, and so the project must be continued into the future--even though its prospects appear grim. Indeed, the sunk cost fallacy is sometimes called the "Concorde effect," after the supersonic jet where development and construction went on long after it was clear that the project was not economically viable. Some evidence suggests that children and animals may be better at avoiding the sunk cost fallacy than adults. At some level, this makes sense. After all, children and animals may be less likely than adult humans to become ego-involved and locked down into what happened in the past, and thus more likely only to look forward. But I'll also admit that, at some level, this theory also sounds a bit ridiculous to me. How does one test whether children and in particular animals take sunk costs into account? The classic discussion of the evidence here here seems to be a 1999 paper by Hal R. Arkes and Peter Ayton called "The Sunk Cost and Concorde Effects: Are Humans Less Rational Than Lower Animals?" It appeared in a 1999 issue of Psychological Bulletin, published by the American Psychological Association (125:5, pp. 591-600). The journal isn't freely available on-line, but many readers will have access through a library. As one example, here's a discussion from Arkes and Ayton of a study looking at whether female albino mice take sunk costs into account, or focus only on the future. A prototypical study ... tested the litter defense behavior of female albino mice. On the 8th day of a mother's lactation period, a male intruder was introduced to four different groups of mother mice and their litters. Each litter of the first group had been culled at birth to four pups. Each litter of the second group had been culled at birth to eight pups. In the third group, the litters had been culled at birth to eight pups, but four additional pups had been removed 3 to 4 hr before the intruder was introduced. The fourth group was identical to the third except that the removed pups had been returned to the litter after only a 10-min absence. The logic of the Maestripieri and Alleva (1991) study is straightforward. If each mother attended to past investment, then those litters that had eight pups during the prior 8 days should be defended most vigorously, as opposed to those litters that had only four pups. After all, having cared for eight pups represents a larger past investment than having cared for only four. On the other hand, if each mother attended to future costs and benefits, then those litters that had eight pups at the time of testing should be defended most vigorously, as opposed to those litters that had only four pups. The results were that the mothers with eight pups at the time of testing defended their litters more vigorously than did the mothers with four pups at the time of testing. The two groups of mothers with four pups did not differ in their level of aggression toward the intruder, even though one group of mothers had invested twice the energy in raising the young because they initially had to care for litters of eight pups. Thus, the magnitude of expected benefits, not the amount of prior maternal investment, determined the mothers' defensive behavior. Arkes and Ayton also discuss a number of other animal studies: the behavior of a kind of fish called a convict cichlids (Cichlasoma nigrofasciatum); a study about how female digger wasps provide dead katydids for their larva to consume; the nest defense behavior of savannah sparrow; and others. They discuss alternative interpretations of these studies, but argue that the results generally support the claim that animals don't take sunk costs into account. Imagine you are at a fairground with your parents. Your mother gives you a 50 pence coin, and your father gives you a one pound coin.After walking around for a while you decide to use the 50 pence cointo buy a ticket for the merry-go-round. [But then you discover that you have lost your ticket./But then you discover that you've lost the 50 pence coin so you can't use it to buy a ticket for the merry-go-round.] Would you use the one pound coin to buy a new ticket? Half the children in each of the three age groups received one of the two sentences inside the brackets. ... [For the older children, when] the money was lost, the majority of the respondents decided to buy a ticket. On the other hand, when the ticket was lost, the majority decided not to buy another ticket. This difference was absent in the youngest children. Note that it is not the case that the youngest children were responding randomly. They showed a definite preference for purchasing a new ticket whether the money or the ticket had been lost. Like the animals that appear to be immune to the Concorde fallacy, young children seemed to be less susceptible than older children to this variant of the sunk cost effect. "It is likely that the 3- and 5-year olds are drawn to the payoff button on the basis of a simple reinforcement notion only. . .. Older subjects . . . employ complex strategies. . . . It is interesting to note that . . . the belief that there is a complex solution actually results in fewer choices of the most frequently reinforced alternative ... The older participants were `too smart for their own good.'" The exact reasons why people pay attention to sunk costs are not clear. One hypothesis is that people or organizations just don't like admitting error. Another hypothesis is that when disregarding sunk costs feels wasteful in some way, and people don't like to waste. Yet another hypothesis is that in many aspects of life, there is a positive correlation between past efforts and future payoffs, and so giving up on a project with large sunk costs feels like it is also giving up on future payoffs. As noted earlier, I'm not confident about interpreting some of the evidence about animals and young children as a strong demonstration that they do ignore sunk costs. But I'm always looking for a lively way to explain basic economics concept to students. Explaining some of the evidence that animals and small childen may be better able to disregard sunk costs--appropriately hedged with caveats-- couuld help some students remember the concept of sunk costs more clearly. Economists have long highlighted the necessity of private property rights for thriving commercial activity. ... Celestial anarchy thus appears to pose a serious obstacle to flourishing outer space commerce. But what if private parties sidestepped the problem posed by sovereigns’ inability to support celestial property rights by enforcing such rights privately—that is., without reliance on any government? ....[I]t is widely believed that a purely private celestial property rights regime is not possible. This article argues that conventional wisdom is wrong. Celestial anarchy is genuine, but the ostensible problem it poses for the development of outer space commerce is not. Private property rights can and do survive without the endorsement or involvement of any sovereign entity. This suggests that private parties can, if given the chance, enforce property rights in outer space. ... Economic theory demonstrates how private individuals can enforce property rights without reliance on government. And economic reality demonstrates how they in fact do so. There’s nothing special about this theory or its manifestations in practice that would limit it to terrestrial property rights. medieval lex mercatoria (law merchant). They argue that this system of law functioned because of the “discipline of continuous dealings,” which basically means that it's not worth defying the private law in any given case, because by doing so, you would lose the ability to be protected by the private law in all future cases. They write: "Since the gain from defecting is a onetime gain but the gains lost from defecting even once are forever, if parties don’t discount the future excessively, they earn more by always cooperating than by ever defecting. Property rights are self-enforcing." Given the difficulties, and for many years the impossibility, of using national sovereigns to enforce international commercial disputes, contemporary international traders rely on private international arbitration associations instead. Indeed, at least 90 percent of modern international commercial contracts contain clauses stipulating the resolution of contractual disputes via private arbitration. The sums of money at stake in these private courts are enormous. For example, in 2001 roughly 1,500 parties from 115 countries used the arbitration services of the International Chamber of Commerce (ICC), the largest of such organizations, in property conflicts that ranged in value from $50 to $1 billion. Over 60 percent of these disputes were for amounts between $1 million and $1 billion. Over time, international treaties now mean that national governments have agreed to enforce the decisions of these private panels: "In 1958 the first multinational treaty aimed at facilitating the enforcement of private international arbitral decisions in the national courts of sovereigns emerged: the United Nations New York Convention on the Recognition and Enforcement of Foreign Arbitral Awards. Since then, many, though not all, countries have signed the New York Convention (NYC)." Perhaps commercial space pioneers would use already-existing arbitration associations, such as the ICC, in order to enforce celestial property rights. Or perhaps a body of private outer space law—informed at its core by familiar precedents relating to nuisance, damages, liability, and so on—might progress to the point that space-specific arbitration agencies, employing their own experts in space law, would serve as the primary dispute resolution mechanism and process by which precedent is set. Alternatively, the first space pioneers might have a voluntary convention in which their representatives form a kind of outer space “social contract,” thereby setting the rules for original appropriation of unowned resources, property rights enforcement, and the proper bounds of behavior between parties when one party’s behavior imposes uncompensated burdens on others. The Salter and Leeson argument is usefully mind-expanding about the potential for private property rights. But as they point out at the end of the article, their argument is essentially one of economics, not of politics. I can easily imagine the kind of regime that they describe as useful for thinking about issues that arise between those who are operating in outer space, applying to the times when they are operating in outer space. But the first time resources or other resources from outer space are brought to Earth in sufficient quantities to be worth a lot of money, or to move prices of minerals in Earth-markets, I suspect that any agreements reached by those who were travelling in outer space will come under Earthly political challenge. Denmark recently announced that it was challenging Russia and Canada for control over the territory that includes the North Pole, and the United States and Greenland also have ongoing claims in Arctic waters. I suspect that nations will try to assert jurisdiction over outer space, too. Charles Dickens wrote what has become one of the iconic stories of Christmas day and Christmas spirit in "A Christmas Carol." But of course, the experiences of Ebenezer Scrooge are a story, not a piece of reporting. Yesterday, I offered an article by Charles Dickens about his views of "masters" and "hands" during a textile strike, written for the weekly journal Household Words that Dickens edited from 1850 to 1859. Here's another piece from Dickens from the journal from the issue of January 26, 1856, with his first-person reporting on "A Nightly Scene in London." Poverty in high-income countries is no longer as ghastly as in Victorian England, but for those who take the time to see it, it for our own time and place, surely it is ghastly enough. "No," said he, quite mollified, and very reasonable, " not at all. What is it ?" My companion and I looked at one another, and the master of the Workhouse added quickly, " Why, Lord bless my soul, what am I to do? What can I do ? The place is full. The place is always full—every night. I must give the preference to women with children, mustn't I? You wouldn't have me not do that?" "Well!" said he. And subdued himself again. "What I want to ask you," I went on, " is whether you know anything against those five miserable beings outside?" "Don't know anything about them," said he, with a wave of his arm. "I ask, for this reason: that we mean to give them a trifle to get a lodging— if they are not shelterless because they are thieves for instance.—You don't know them to be thieves ?" "I don't know anything about them," he repeated emphatically. "That is to say, they are shut out, solely because the Ward is full?" "Because the Ward is full." "And if they got in, they would only have a roof for the night and a bit of bread in the morning, I suppose?" "That's all. You'll use your own discretion about what you give them. Only understand that I don't know anything about them beyond what I have told you." The article does not seem especially well-known today, but it is the source of a couple of the most common quotations from Charles Dickens about "political economy," as the study of economics was usually called at the time. Early in the piece, Dickens wrote: ""Political Economy was a great and useful science in its own way and its own place; but ... I did not transplant my definition of it from the Common Prayer Book, and make it a great king above all gods." Later in the article, he wrote: "[P]olitical economy is a mere skeleton unless it has a little human covering andfilling out, a little human bloom upon it, and a little human warmth in it." Mr. Snapper laughed at me. As I thought I had just as good reason to laugh at Mr. Snapper, I did so, and we were both contented. "Ah!" said Mr. Snapper, patting his counterpane with a hard touch. " You know very little of the improvident and unreasoning habits of the common people, I see." apparently inseparable from the phrases working people and lower orders, gradually fall into complete disuse for this reason." "Well, but we began with strikes," Mr. Snapper observed impatiently. " The masters have never had any share in strikes." "Yet I have heard of strikes once upon a time in that same county of Lancashire," said I, " which were not disagreeable to some masters when they wanted a pretext for raising prices." "Do you mean to say those masters had any hand in getting up those strikes?" asked Mr. Snapper. branch trades, who have good memories," said I.
Mr. Snapper, after again opening and shutting his gloved hands several times, drew the counterpane higher over his chest, and went to bed in disgust. He got up at Rugby, took himself and counterpane into another carriage, and left me to pursue my journey alone. "The earth was not made for the misery of its people; intellect was not given to man to make himself and fellow creatures unhappy. No, the fruitfulness of the soil and the wonderful inventions —the result of mind—all proclaim that these things were bestowed upon us for our happiness and well-being, and not for the misery and degradation of the human race. "It may serve the manufacturers and all who run away with the lion's share of labour's produce, to say that the impartial God intended that there should be a partial distribution of his blessings. But we know that it is against nature to believe, that those who plant and reap all the grain, should not have enough to make a mess of porridge; and we know that those who weave all the cloth should not want a yard to cover their persons, whilst those who never wove an inch have more calico, silks and satins, than would serve the reasonable wants of a dozen working men and their families. accomplishment, is worth struggling for, set to work and cease not, until you have obtained the good time coming, not only for the Preston Operatives, but for yourselves as well. "By Order of the Committee. So we'll sing success to Hornby and Blackburn for ever. May Hopwood, and Sparrow, and Hornby live for ever. We warn these Preston Cotton Lords to mind for future time. We sing success to Stockport and Blackburn for ever.
" Now, lads, give your minds to it." So what's the top research prize going to younger economists? The John Bates Clark medal is a prize given by the American Economic Association "to that American economist under the age of forty who is judged to have made the most significant contribution to economic thought and knowledge." In other words, it highlights a scholar who has already been doing the kind of work for which--who knows?--a Nobel prize might be awarded in a few more decades. As you might imagine, the leading contenders for the Clark medal are usually in their late 30s, rather than a few years younger. in part because the extra few years means that there has been more time to publish research, and in part because there is a feeling that those their early 30s, even if already worthy of the award, will still be eligible in a few more years. Thus, it is a sign of the high regard in which Raj Chetty's work is already held that he was awarded the Clark medal in 2013 when he was 33 years old. For an very short overview of Chetty's work, you can read a "report" given to the Clark medal committee here. Martin Feldstein write a more in-depth but still fairly short and readable treatment of Chetty's work on the occasion of his receiving the Clark medal in the Spring 2014 issue of the Journal of Economic Perspectives. Douglas Clement interviews Chetty in the December 2014 issue of The Region, published by the Federal Reserve Bank of Minneapolis. Here, I'll offer Chetty's comments on a couple of his recent areas of prominent work: the importance of teacher quality, and the level of intergenerational economic mobility in the United States. "How can we measure and improve, possibly, the quality of teachers in public schools in America? We tackled that question by getting data from one of the biggest urban school districts in the United States, on 2½ million children over a 20-year period, during which they wrote 18 million tests. "We take that data, which tells us how students did in math and English, what teachers they had, which classrooms they were assigned to and so forth, and link that to administrative records from tax returns and social security databases on students’ earnings, college attendance outcomes and various other markers of success later in life. So, essentially, the type of question we are able to ask is, how did the third-grade teacher that you had affect your success 25 years later? ... If you’re assigned a high value-added teacher in third grade—that is, the teacher who is systematically improving test scores—and I happen to get a low value-added teacher, does that impact last? Are you, in fact, doing better many years later, or are we both doing as well as each other? "The prior literature in education would lead us to think that these impacts are not that long lasting. Many studies have shown that test score gains tend to “fade out” over time. What that means is that if a child is assigned to a better teacher in third grade, we see her doing better on third grade tests, but a lot of that gain shrinks by the end of fourth grade and virtually disappears by fifth or sixth grade. Based on that evidence, you might have thought, well, by the time we’re looking at people’s earnings years later, so many other things have happened in their lives, and we’re not really going to find a meaningful effect of these teachers. ... And so going into this work, our prior assumption was we might find something, but more likely we might not find any lasting impact, which would also be useful to know. So we were very curious to look at the data. "Much to our surprise, it immediately became evident that students who were assigned to high value-added teachers showed substantially larger gains in terms of earnings, college attendance rates, significantly lower teenage birth rates; they lived in better neighborhoods as adults; they had higher levels of retirement savings. Across a broad spectrum of outcomes, there were quite substantial and meaningful impacts on children’s long-term success, despite seeing the same fade-out pattern for test scores." "How has intergenerational mobility changed over time in America, and how does it vary across places within the U.S.? There’s a popular conception that the U.S. once was a great land of opportunity and that that’s no longer true today. Unfortunately, we’ve had relatively little data to actually be able to study the degree of social mobility systematically in the United States, so it is has been hard to know whether this conception is accurate or not. "When we actually looked at the data over the past 30 to 40 years or so—a period for which we have good information from de-identified tax returns on children’s parents’ income as well as their own income—we find that, much to our surprise, there isn’t that much of a difference in social mobility in the United States today relative to kids who were entering the labor force in, say, the 1970s or 1980s. That is, children’s odds of moving up or down in the income distribution relative to their parents have not changed a whole lot in the past few decades. "We’re studying 20 million families that moved with their kids between metro areas of the United States. We ask if you move, say, as a 5-year-old, from Atlanta to Salt Lake City, do your outcomes improve? Do you look more like the kids who grew up in Salt Lake City and did really well? And secondly, how does that play out, depending uponwhen you moved? If you moved when you were 10 years old or 15 years old, rather than as a 5-year-old, do you get less of the benefit? One of the intriguing preliminary findings from this work is that there’s a linear “exposure effect.” Every extra year you spend in a better environment, your own outcomes improve and converge to the outcomes of the prior residents. This type of evidence strongly suggests that the differences in upward mobility across places are actually a causal effect of growing up in, say, Salt Lake City rather than Atlanta, as opposed to just differences in the types of people who live in Salt Lake City versus Atlanta." The interview introduces some other prominent work by Chetty, as well. For example, there was the study of tax "salilence," to see whether people pay attention to sales taxes. The researchers labelled a selection of about 1,000 products in a story with a label that showed the price plus the sales tax. In theory, this should make no difference to consumer behavior: after all, doesn't everyone already know that you will need to pay sales tax at the register? But in practice, showing the higher price with the sales tax caused sales of that product to decline. This finding also suggests that sales taxes might change purchasing behavior less than one might expect--because a lot of people are largely ignoring them. As another example, there's a well-known empirical finding that when people have more generous unemployment insurance, they are on average slower to find a new job. The standard economic explanation for this pattern had been that when people have more generous unemployment benefits, they don't look as hard for a new job. The implication is that many unemployed people could take suitable jobs sooner, if they were motivated to do so. Chetty suggested the possibility of another explanation: perhaps unemployed people are looking for a good job match--that is, a job that reflects their skills and experience. More generous unemployment benefits give them a chance to search for longer period, thus raising their chance of a good job match. Here, the implication is that many unemployed people do not have a suitable job match that is readily available, but that those who run out of funds--because of less generous unemployment insurance--are then pressured by sheer lack of income to take a less suitable job. How might one distinguish between these hypotheses? Chetty looked at data on the savings of the unemployed. Imagine a people in different states who have differing levels of unemployment benefits, but some have higher savings and some have lower savings. It turns out that when those with more saving have more generous unemployment insurance, the negative effect on their finding a job is much lower. Chetty says: "I end up concluding that something like two-thirds of the relationship between unemployment benefits and unemployment rates, is actually due to a liquidity effect, rather than a distortionary moral hazard effect." In other words, many of the unemployed are looking for a good job match, but if they have little savings, they are more likely to run out of funds before they can find it. More generous unemployment insurance helps the unemployed wait a little longer for a better job match, which is ultimately better for the worker and the economy. If you aspire to follow economics and economic news, get familiar with Chetty's name and work. You'll probably be hearing about it for the next few decades. The U.S. corporate income tax always seems controversial. Are U.S. corporations taxed too little? Are they taking jobs and business outside the U.S. because they are taxed too much? Should the goal be to eliminate the corporate tax and instead focus on how we tax those who benefit from higher corporate profits through dividends and capital gains on stock ownership? But while we are having these arguments, an increasing number of U.S. firms are organizing themselves as "flow-through" businesses, in which the corporate tax does not apply to profits, because the profits flow immediately through to owners. total adjusted gross income reported on individual income tax returns. 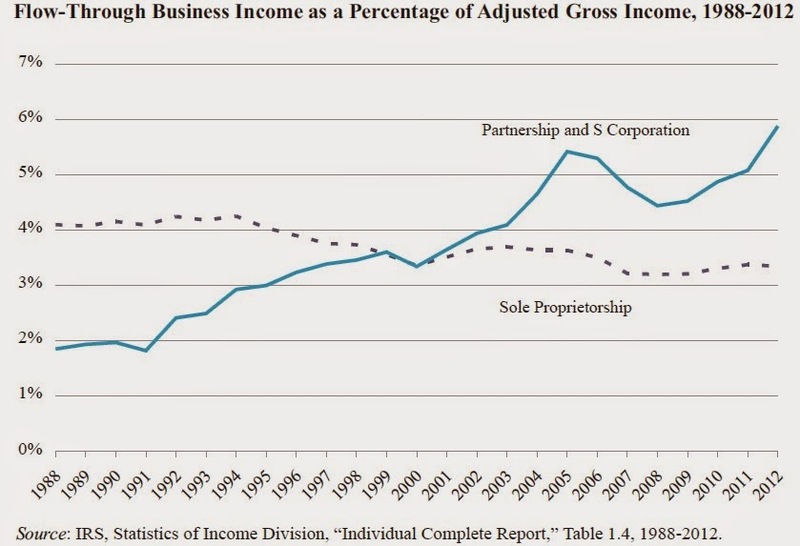 ... [I]income from partnerships and S corporations has more than tripled as a share of AGI since the late 1980s. 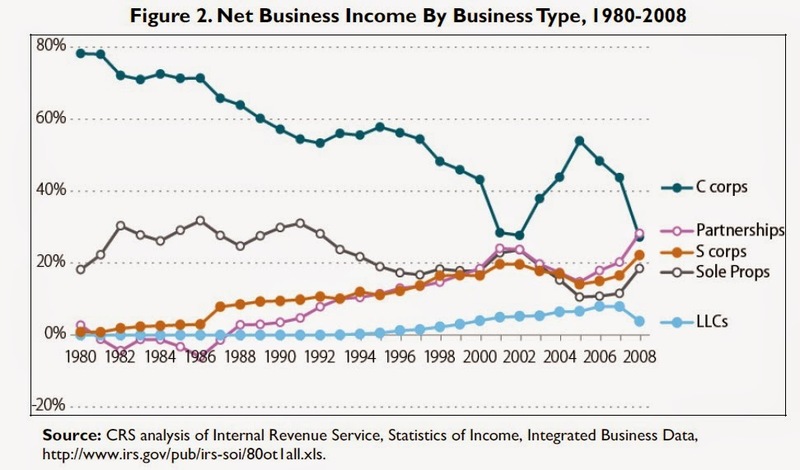 For another perspective, here's some data on the share of net business income generated by the type of business, from a 2013 report by Mark P. Keightley for the Congressional Research Service. Back in 1980, nearly 80% of business income went to "C" corporations--so named after the applicable part of the tax code that governs them--which are what most of us think of when we think of a "corporation." Back then, the remaining 20% was almost all sole proprietorships, which were just taxed as individual income. An S corporation is a “closely held” corporation that elects to be treated as a pass-through entity for tax purposes. S corporations are named for Subchapter S of the IRC, which details their tax treatment. By electing S corporation status, a business is able to combine many of the legal and business advantages of a C corporation with the tax advantages of a partnership. Several criteria must be met if a corporation wishes to elect S corporation status. The corporation must be incorporated and organized in the United States. An S corporation can only issue one class of stock and is limited to no more than 100 shareholders. The shareholders must be individuals, estates, certain types of trusts, tax-exempt pension funds, or charitable organizations. All shareholders must be U.S. citizens or residents. The Congressional Budget Office looks at some of the reasons underlying the move away from C corporations and toward S corporations in its December 2012 report, "Taxing Businesses Through the Individual Income Tax." The CBO points out that a shift toward service industries in recent decades is part of the change, since a number of service industries find it relatively easy to organize as partnerships or S-corporations. Reductions in top tax rates for individuals made receiving business income as an individual more attractive. Tax laws were also changed to increase the maximum number of shareholders there could be in an S-corporation from 35 to 75 in 1997, and then from 75 to 100 in 2005. Back in the 1960s, the corporate income tax often collected 4-5% of GDP. Since about 1990, it has more commonly collected 1-2% of GDP. Part of the reason is that a smaller share of business income is flowing through the conventional C corporation form. For example, the CBO estimates that if the C-corporation tax rules had been applied to the income from S corporations and limited liability partnerships in 2007, total federal tax revenues would have been $76 billion higher. The CBO estimates that the movement to S corporations and partnerships may have somewhat longer to run. When firms see a way to organize themselves as flow-through organizations that can avoid the corporate income tax, as in the case of partnerships and S corporations, they have been increasingly aggressive about doing so. But the underlying issue here is the need for reform of how the U.S. taxes corporations. A standard problem that economists point to is that corporate dividends are taxed twice: once as corporate profits, and then again as individual income when they are passed to shareholders. Flow-through firms avoid this problem by just having profits flow out of the organization each year, and then taxing those profits as individual income. But many corporations hold on to a lot of the profits that they earn and reinvest them in the company. It makes sense to apply a corporate tax to those kinds of firms, because otherwise, it would be possible for people to plow back their income into the corporation each year and escape taxation in that way. It's a complicated business to think about how flow-through ideas might be applied to modern C corporations, but it's a discussion that's overdue. Islamic finance came to the United States in the 1980s when two institutions opened on the West Coast. ... The institutions operational today provide services in several states, most prevalently where the Muslim population is concentrated. University Islamic Financial (a subsidiary of University Bank) based in Ann Arbor, Mich., serving the large Muslim population of metropolitan Detroit and surrounding states, is the first and only exclusively Sharia-compliant bank in the United States — it offers no other products. Devon Bank in Chicago is the only other bank regularly offering Islamic financing products. Reston, Va.- based Guidance Residential is the largest nonbank financial institution offering Islamic finance services, having provided more than $3 billion — which it claims is nearly 80 percent of the total — in musharaka mortgage financing in 22 states since its doors opened in 2002. California-based LARIBA is another large Islamic mortgage lender, and it also provides business financing. "To critics, Islamic finance is a distinction without a difference. According to research by Feisal Khan, an economics professor at Hobart and William Smith Colleges in upstate New York, most Islamic finance transactions are economically indistinguishable from traditional, debt- and interest-based finance. Where there is principal and a payment plan, there is an implied interest rate, Khan argued in a 2010 article. He is not the first economist to make such a claim. Many Islamic scholars argue that murabaha contracts don't share risk and thus are not Sharia-compliant — and experts estimate that such contracts constitute up to 80 percent of the global Islamic finance volume. Other economists have noted that the terms of Islamic financial contracts often move with market interest rates. In the United States, Islamic financial products are frequently marketed with information about implied interest rates to allow customers to compare prices or simply to comply with American regulation. A study of Malaysia, the world's largest Islamic finance market, found that Islamic deposit rates fluctuate in step with market interest rates." U.S. financial authorities seem to agree. Banks here [in the U.S.] are normally prohibited from taking on partnership or equity stakes in real estate, a provision meant to limit speculation. But in Islamic finance, the bank assumes formal ownership. Regulators in the United States have held, however, that Islamic finance is compatible with the prohibition on real estate investments in some cases. In 1997, the United Bank of Kuwait (UBK), which then had a branch in New York, requested interpretive letters from its regulator, the Office of the Comptroller of the Currency (OCC), on ijara and murabaha mortgage products. The OCC approved them on the very grounds that they were economically equivalent to traditional products. Another factor is that non-Muslim governments are moving toward issuing sukuk to draw the investment of oil-rich Muslim countries. In June, the United Kingdom issued more than $330 million in sukuk — compared with more than $100 billion in global sukuk offerings in 2013 — becoming the first country outside the Islamic world to do so. Prime Minister David Cameron said he wanted to make London "one of the great capitals of Islamic finance anywhere in the world." Luxembourg, Hong Kong, and South Africa have announced plans for their own offerings. Sukuk may also provide liquid assets to help domestic Islamic banks manage their balance sheets. In the old days of macroeconomics, say up to 2007, macroeconomic policy was almost entirely about fiscal and monetary policies. But in the last few years, an alternative called "macroprudential policy" has risen up. The notion is to affect the macroeconomy by using financial regulations about the permissable extent of bank capital and collateral lrequirements, consumer borrowing, margin requirements for financial trades, rules governing what derivatives are allowable, and more. Janet Yellen has argued that when it comes to financial stability, and the risks it poses to macroeconomic stability, macroprudential policy needs to play a primary role. Here's a discussion of the past use of what we would now call macroprudential tools in the U.S. economy. 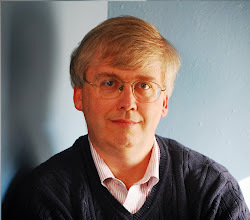 For a useful starting point to the topic, Dirk Schoenmaker has edited an e-book called Macroprudentialism, a VoxEU.org eBook from the Duisenberg School of Finance and the Center for Economic Policy Press, which includes 15 short chapters from various perspectives. Here is a scattering of some of the comments about macroprudential regulation that especially struck me. Anil K Kashyap, Dimitrios P Tsomocos and Alexandros P. Vardoulakis: "While virtually every central banker in the world is on record supporting the concept of ‘macroprudential regulation’, there is still no agreed upon definition of what it means or how best it should be implemented. helps to guard against the exercise of arbitrary power by unelected officials. But a static rulebook is the meat and drink of regulatory arbitrage, which is endemic in finance. Finance is a ‘shape-shifter’. "This shape-shifting dynamic can leave policymakers in a game of catch-up, responding only as each metamorphosis becomes systemically significant. Unless they are empowered to respond flexibly, it is a game they are doomed to lose. By the time the products of regulatory arbitrage are evidently systemically significant, those in the driving street will likely have the lobbying power to delay or derail reform. The powerful forces mobilised to oppose reform of the globally significant US money market fund industry illustrate that in capital letters. of securities when the pattern of aggregate issuance is driving or facilitating excessive borrowing by firms or households. That means, second, that if finance remains free to innovate, adapt and reshape itself, every kind of financial regulator must be in the business of preserving stability. That needs to be incorporated into their statutory mandates and, more generally, into the design of regulatory agencies." predicated to achieve price stability, we needed a second instrument to maintain financial stability; hence macroprudential instruments. ... As long as macroprudential instruments are able to vary the capital ratio applicable to loans, they could be effective, but only time will show how effective. ... I have argued that central banks have now been allocated responsibility for financial stability, whether keen to do so or not. If so, it would seem odd not to also give them command over the main levers (i.e. instruments) for achieving such stability. Moreover, several of these instruments involve either imposing requirements on banks – e.g. state-varying capital requirements – or changes to the central bank’s own portfolio – e.g. acting as market-maker of last resort via credit expansion (CE) – that would seem necessarily to be within the natural province of central bank decision-making." humility in recognising their limitations. Naively designed macroprudential policies are likely to have unintended effects. Due to the inherently complex nature of systemic policies, the scope for such side effects is much larger than for traditional policies, and may easily come to outweigh the benefits. Policymakers need to step up their efforts in making sure that new macroprudential policies are incentive-compatible and do not distort the behaviour of participants in the financial system.